Korean tractor brand Branson has released its new 60hp 6225 tractor range. 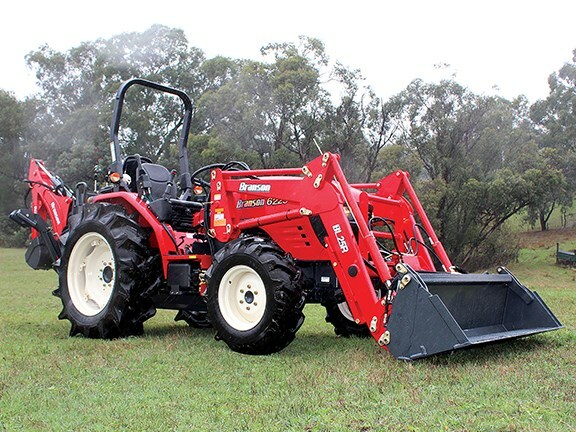 Korean manufacturer Branson has introduced the new 60hp compact 6225 tractor to Australia. Branson tractors are distributed in Australia by Midway Sales, and company director Scott Spring-Brown says the release of the new 60hp 6225 tractors is an exciting development. "We’ve worked closely with Branson to bring the best of this world-class range to our market," Spring-Brown says. "A cast-iron rear end and transmission housing give this range the best ballast for maximum traction." The 6225 sits at the top end of the compact tractor category, weighing in at more than 1,740kg excluding the loader. Sporting a 2.3 litre turbo charged engine, the 6225 range is available in four variants. The baseline open-cab model is fitted with ROPS and shuttle shift transmission; another model is ROPS with hydro transmission. There are also two enclosed cabin models, with either shuttle or hydro transmission. All models are factory fitted with the highly regarded Ansung front-end loaders as standard, and the 4-in-1 bucket can blade, level, scoop and grab. A quick-release means the bucket or entire loader can be easily removed. The single-lever, press-button joystick control is simple to use and the self-levelling feature enables safe and efficient material shifting, according to Midway Sales. "A stand out feature in all Branson tractors is the impressive turning circle for outstanding manoeuvrability," Spring-Brown says. The range features independent electric two-speed PTO, and two sets of hydraulic remotes for powering hydraulic implements. The category 2, three-point linkage can handle up to 1,500kg. A high-capacity hydraulic pump delivers 42 litres per minute for hydraulic implements such as front end loaders or rear-mounted backhoes. If you're looking for used compact tractors for sale, check out our listings.